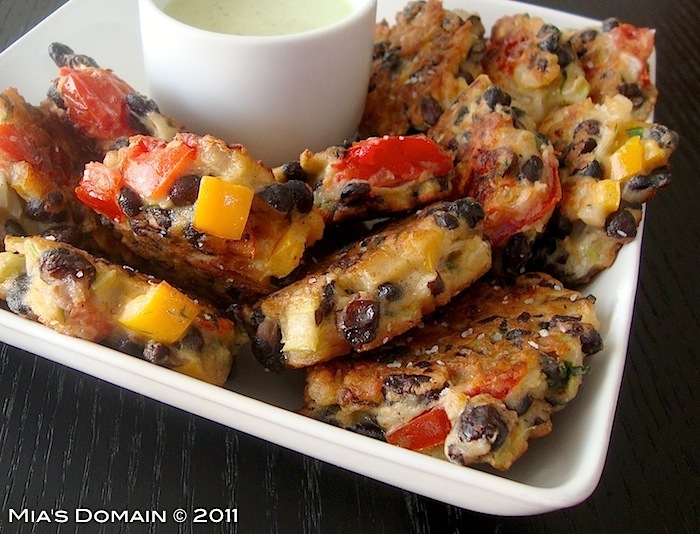 These quick-to-make fritters are full of flavor. To make them even lighter, separate the eggs and whisk the egg whites until they form soft peaks, then carefully stir in with all the other ingredients. Combine all the ingredients in a large bowl, stir well to combine (add more flour if it's not binding). Season with sea salt and black pepper. In a large skillet,add three tablespoons of oil to the pan on medium heat. When hot, add tablespoonfuls of the bean mixture. Fry on one side until golden brown and crispy (about 3 minutes). Flip over for a further three minutes. Remove and drain on a paper towel. Season with fresh black pepper and sea salt. Blend all the ingredients for a smooth consistency. Season with sea salt and black pepper. Thank you for the recipe. Wha would you suggest if I needed to leave out the flour? Could I use corn flour by chance? Have a great day. Going to make this ,by following exactly the same recipe..Loving this..am sure my son would also love this..Thanks 4 sharing. !Pls visit my blog when u get time..
Holy Freakin' Yum! All the things I love in one little fritter. Going to have to try this soon! And the sauce looks heavenly. Thanks for the recipe! what's the calorie breakdown? have you tried a different oil since Olive oil breaks down and actually is rancid at high temps? I use olive oil for frying with no problem at all unless I get distracted and leave the pan on the heat too long. Grapeseed oil is probably the best, but does not have that nice flavour you get with olive oil. I made these last night and they were the hit of the Cinco De mayo party. Mine fell apart a bit too but overall they were easy to make and different then the usual Mexican appetizers! I made these last night, and mine too fell apart. I realized afterwards that I forgot to add the flour. I don't think it would have made that big of a difference. I added a 3rd egg after the first batch crumbled. Second batch was a little better. But still flimsy. Nevertheless, super yummy!! Update: Added flour to remaining mix, used a smaller pan with less oil. Came out PERFECT!!! I guess the flour DID make a big difference. YUMMY YUMMY. Had them for breakfast today with cantaloupe and some cayenne chocolate silk. Kelsey (or anyone else) - did you end up trying the recipe with corn flour or another gluten free substitute? These were super yummy! I used homemade black beans and a little parm. Mine also didn't stick well enough to pick up and dip but we ate them as a patty with the sauce on top. Will definitely make again! Thank you! I just made these but they completely fell apart. Had the flour and eggs just as recipe asks for but they still fell apart and burnt a little. I may try again but will try to make the patty in my hands and form before putting in oil. We still ate them and sauce is yummy! I made these tonight. I added about 1/2 c flour to help bind them and I was skeptical but if you get the oil hot it binds them together! So good! will this work well with canned black beans? Can you bake these instead of frying? I just made them, I put 1C less beans because I thought I had enough. I had no problem frying them, they didn't fall apart at all. I made a cilantro mayo dip to use the last of the cilantro I had on hand and it was wonderful. My mother loves it! (she's a vegetarian so I made this for her) I baked half the recipe in muffin tins and those came out JUST AMAZING. So so so pretty and tasty I'm going to have a hard time saving some for my veggie friend who comes over tomorrow. I'm 100% certain these will be made again. Soon. This week. Mia, is the egg just for binding? Do you think I could use flax seed paste as a sub? My son has an egg allergy. Flax works great for binding, but not when the eggs are used for flavor. Thanks! This looks delish! These are super delish. I followed advice of other posters and added an additional egg, and a little more flour (probably a little less than a 1/4 cup). I also substituted fresh corn from one corn cob for 1/2 the amount of yellow bell pepper, and put a couple dashes of smoked paprika in. Once you spoon the patties in the frying pan, hands off 'til you turn them (or they will crumble)! For the sauce I added a couple of chipotle peppers, along with some fresh lime juice. I also added some crushed pepper, just because I like the spice!! Made these tonight - tasted great! Made a few adjustments that might help some other people (I'm gluten-free). I used brown rice flour instead of wheat flour, and the first one was falling apart in the skillet. So I added a couple shakes of xanthum gum (roughly 1/2 tsp) - voila! They stayed perfectly round. Also fried with Safflower Oil to reduce the chance of free radicals. Olive oil is supposed to be used for lower temperatures because when heated around or above medium, it begins to morph. Safflower oil has a super mild taste and it did a great job with these! I think I'll keep the xanthum gum and experiment with baking them next time for a healthy version. I have made a recipe close to this if you use can beans take half of the black beans the recipe calls for and mash them like a you were going to make refried beans. This helps hold the rest of the ingredients together when you mix them in together.I used canola oil to fry them in. There are awesome! I had no problems. just added a bit more flour. And I figured out that each one is about 90 calories, if you make 16. Not bad! That's brilliant Christy. Thank you! No answered the question about flour substitutions for gluten-free fritters. Anyone? Winky - use all purpose GF flour mix. Anonymous - Hi. Hopefully you've had a chance to take a look at "My Inspiration" and what's in my header. My blog is not so much about dieting as it is about using, preparing, and enjoying "real" food. I'm not a calorie, fat, carb checker at this time, but there is this site http://nutritiondata.self.com/ that seems to have all sorts of great nutritional data if you are in a situation where you find it necessary. Christy up above seemed to do a great job figuring out the calorie count! Hope that helps. This looks great. I hate cilantro, so will leave that out. Any suggestions for something else to dip in? I'm thinking just regular salsa. I made these tonight & my family loved them! I took the advice from another comment & processed half the black beans so that they would hold together better. Worked great and didn't need any extra egg. I ended up increasing the flour by 1/4 cup to give it the crispy shell it needs. Make sure if you are using canned black beans that you fully drain them. Thank you for the recipe...will definitely make again! Did not have any black beans, so subbed, garbanzo. I would think canned kidney or white beans would work also. For the sauce, subbed, two different tomato relishes, one was sweet and both were excellent with this. I think a variety of green, red (which I used), white or yellow onions would work. Also added 1 Tablespoon of oak flour. Increasing the flour appears to be a must. mash some of the beans and mix in with flour and egg. Added some nutitional yeast to add more vit B's. I too ate them as vege burgers. mmmmmm! Kathy - salsa will be great. Thank you very much Susan. That's great to know. Anonymous - Your comment is very helpful to all who makes this. Thank you! I made this recipe two nights ago. I changed it just a bit to fit into my style of cooking. I started with 2 cups of dry black beans, soaked them, then rinsed and drained. Then I cooked them with a clove of garlic, 1/2 onion, diced, some dried celery leaves and a carrot from the garden. I cooked the beans until the liquid had thickened. I let them cool, then added fresh onion, garlic, bell pepper, tomato and corn. I also added some bread crumbs to the mix just to give it some body. We made burger patties and they were fabulous. I made 12 burgers and still have 2 cups of mix leftover. Tonight, I'm adding some oregano, diced fresh mushrooms and eggplant, and grated parmesan to make meatballs to go with spaghetti squash and homemade marinara. This was the first time I've ever really liked a veggie burger. Thank you, Mia. Julie - I love what you did! Thanks for sharing!! I made this recipe last night and it was delicious. Thank you! I had to add another 1/2 cup of flour because they weren't binding. I also added to the sauce and I think it came out really good. I wanted to share it. I hope you like it. Thank you again for the recipe. I made these tonight and loved them! Thanks for the tip about not touching them until flipping. It looked like they wouldn't hold together when I put them in the skillet, but I didn't touch and they made perfect little patties. Yum! Making these right now. Added some flax just for fun, and they're holding together like champs at exactly 3 minutes :) DELICIOUS! any ideas for a different type of dipping sauce? we are anti-cilantro in my household! once these are made do you think the would freeze and reheat well. I love doing bulk freezer meals and theses would be a perfect sub for meat for me one night. thanks. Mackenzie - As long as it's airtight. It would freeze well. Hi! I just wanted to let you know I am including this in a 35 Christmas party appetizers and drinks collection over at Mommy's Sweet Confessions. Thank you! Has anyone tried freezing the patty before cooking? When I make black bean burgers, that is the only way they stay together. Thanks for the recipe, I am making them tomorrow. Made these last night and they passed the husband test with flying colors! I have an allergy to gluten and dairy so I used GF flour (had to use about 1/4 cup more than called for b/c it wasn't quite binding like I wanted). Also, because of the dairy allergy I couldn't do the sauce so I found this recipe - http://ohsheglows.com/2011/05/04/vegan-enchiladas-with-cilantro-avocado-cream-sauce-2/ it was an amazing dairy free replacement! I don't always love using olive oil so I tried frying them in coconut oil and it worked great. Thanks for this great recipe!! I made these with Harina de Maiz (corn flour) and they turned out well! Hot oil is key to helping them stay together during flipping. Just cooked these up with a few adjustments to match what was in the pantry. I had to use one 16 ounce can black beans (drained) and about a rounded 1/3 cup flour. I omitted the cilantro and bell pepper, but increased the garlic and onions. I left half of the fritters whole and the other half were chopped up to fall apart (extra crispy). Everything turned out delicious. This created three huge servings. Wow! These were great and a huge hit with my husband and 5yr. old. I made a few changes. I used half black beans and half pinto (I didn't have enough black). I smashed half of the beans. I didn't have any cilantro, so I used oregano and cumin. I used almond meal as a gf alternative (or paleo alternative). I used my pancake griddle to cook them on. IF you leave them on long enough, they won't break apart. We ate them on living lettuce leaves. YUM!! Thanks so much for the recipe. I used GF APP flour and it worked the same. I also baked mine. It had a nice crispy crunch. I actually changed it up a little bit. I added corn and a little tomatillo and I substituted corn muffin mix for the flour. They were so good. Looking very tempting and colorful fitters. I used rice flour tonight and they stayed together. Loved them. i made these and posted in my blog. i had the problem with binding and the "patties" falling apart. i will try again with one more egg and the corn suggestion with less bell pepper and also will consider using less beans. glad i stopped by to see what other testers found with this recipe. love, love, love the "dipping" sauce. Olive oil isn't ideal for high heat. If you do use it for frying, heat the pan up first, until almost smoking. THEN, add olive oil. Just sayin. I love these and make them often with some modifications. I add a touch of cumin & cayenne every time (yum!). Depending on how hard I'm training, I sometimes add cheese. I've taken to making larger patties and baking them at 400˚F for 15 - 20 minutes. If I want them a touch crunchier I'll heat up the non-stick skillet and toss them on there. While the dip here is yummy, I sometimes just whip up a quickie w/ Greek yogurt and Siracha sauce (double yum). Thanks for sharing this healthy, versatile, and delicious dish! Now that sounds so good!! Thanks for sharing! i THOUGHT i had issues with it falling apart but upon hitting the hot oil they stuck together fine. they were not, however, as pretty as the photo on the recipe...but that's ok. they were ALL KINDS of good! Dipping sauce? i cant even talk about that right now it was so delicious. that's all im going to say about that! Thank you so much! The sauce is really delicious with seafood dishes and pork. I just made these and they turned out great. I did add about 1/2 cup more flour, but that's probably because I didn't drain my beans as much as I should have. Cooking these reminded me of pancakes - they have to brown up on the side before you can flip and you don't touch either side while they are cooking. They came out great! Thanks for sharing the recipe! This recipe is my most fav pin from Pinterest thus far. Just added extra flour and used Safflower Oil. So, so yummy! Try blending half of your beans in a food processor and add a bit more flour to make sure these bind and don't fall apart. I halfed everything but still used 2 eggs. Fried in coconut oil. FANTASTIC! Thanks, Mia!
. The sauce I made used half sour cream, half mayo, garlic salt, good amt of cilantro, juice of one lime. And finely minced jalepenos. Debbie - thank you so much!! That sounds amazing! Love your tweaks! I am going to try substituting brown frice for the flour. Have a salmon cake recipe using brown rice as the filler and they worked perfectly and baked instead of fried. Made this tonight my family was estatic! After reading the comments and going with what I had on hand - here's how I tweaked the recipe. Used 1 cup corn instead of orange pepper, a medium red onion, Bob's Red Mill Garfava flour. I also mashed half the black beans. for the dressing I used 1% fat yogurt, with 1 tsp honey, some chili pepper lime, garlic powder. Baked some and fried some. The fried ones tasted better -- cooked them in coconut oil. My 7 year old is begging me to make these again tomorrow night! I'm so glad! I like the mashed idea - will certainly do that next time. Thank you so much for sharing! I used corn meal, and they came out great! A little crumbly, but no big deal. I'm going to add some shredded cheese next time! Thanks for the recipe! That's another great idea! Thanks for sharing! My family LOVED this! I used canned black beans and "drained" the excess juice. Followed the recipe exactly and cooked on a griddle on high (about 450) It was best to "plop" the mixture on and "leave them alone" until turning once when browned. I didn't have any fall apart this way. The only thing I did different with the dip was add a little lime juice. It's a "keeper recipe"! These will be a go to for us from now on. I will probably add some finely chopped carrots and sub some flax seed for an egg in the fritters, and sub some avocado in for the cream/yogurt in the dip. DELICIOUS! I almost ate them all before I could let anyone else try :) Thank you, thank you! Why is it Suddenly Cheaper to Eat Out? What Additives Are In Your Favorite Food? How Do I Know if I’m Really Eating Halibut?